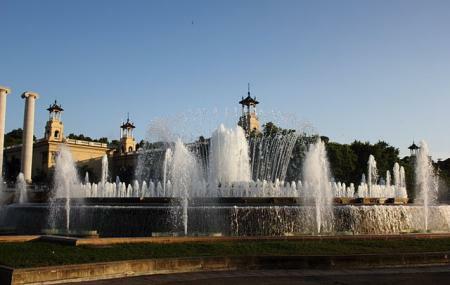 The light and sound show reach a new dimension at the Magic Fountain of Montjuic. The set of ponds and the waterfalls of the Maria Cristina axis contribute to the main element of this magical phenomenon. Around 2600 litres of water per second oozes from the three concentric ponds with a water circulation system and creates magic along with LED Lighting. From classical Spanish music to the popular retro tracks of the eighties and music from comic book movies and cartoons –there are a number of soundtracks that complement the show. It has about 7000 million possible combinations of water and light arts with the combination of the hydraulic and lighting elements and choreography. Now that is something you call magic! How popular is Font Magica De Montjuic? People normally club together Poble Espanyol and Camp Nou while planning their visit to Font Magica De Montjuic. People also prefer to end their day with Font Magica De Montjuic. Stunning light show with water and music. It is really busy in certain locations however you can find a lot of seating. Some with amazing views. The show is only at certain times so make sure to come early so you are not disappointed. Be careful of the splash area. There are people sell all sort of items nearby. Family friendly. Make sure to visit if you are free in the evening. Only happens on Thursday, Friday and Saturday. Magic fountain is a good show to see but there is actually nothing very special. Sometimes they play very good music but sometimes it is just irrelevant. But it is nice to watch all the harmony of the lights and the water flowing in the air. But if you are a tourist and if you have little time in here I wouldn't bother to come. I very enjoyed the show which is for more than 1 hour. Different type of music and thanks to the close gallery, u can enjoy various views over the city and fountains. I would put music a bit louder, thow. There is a lot of possibilities to buy drinks or food by local sellers, obviously more expensive than usual, but useful. Very romantic.